Horror unfolded in Charlestown early yesterday morning when four persons, including three minors, perished in a fire of unknown origin which gutted the heavily-grilled two-storey building they occupied at Lot 2 Drysdale Street, Charlestown. Dead are Princess International Hotel employee, 23-year-old Abiola Taylor and her four-year-old son Justin Taylor; three-year-old Kelisha Solomon and her one-year-old sister Akesha Cordis. The latter two children’s mother, 20-year-old Yolanda Cort, an employee of Edward B. Beharry and Company, is currently nursing third degree burns at the Georgetown Public Hospital. The man said everyone had believed that the occupants had escaped the house, since there was one safety grille at the back of the house that was open. “But no one make it out. They got trapped,” he stated. Another man, who only gave his name as ‘Jermaine’ said he lives in the area and learnt about the fire after persons raised an alarm. He said he aided the firemen who arrived promptly at the scene. Jermaine explained that the glass windows of the building shattered due to the intense heat. He explained that firemen had a difficultly passing the safety grille at the front of the building, but eventually succeeded in doing so. He narrated that when he entered the building, the house was completely filled with smoke which made it impossible to see anything past his stretched out hands. He said the roof of the house had already caught on fire with fragments falling on his person while firefighters doused the building. 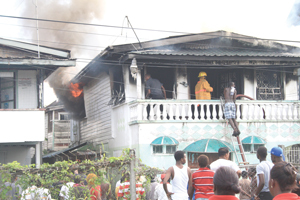 The man explained that along with the fire ranks, he ventured further into the house, where he passed a small child on the floor, whom he believed to be Kelisha Solomon. Jermaine explained that the minor was crouched just outside the bedroom door. Jermaine continued that Abiola Taylor was crouched in her bed, still clutching her pillow while her son, Justin, was still resting at her side. Kaieteur News learnt that the woman had worked the late-night shift at the Princess Hotel and had returned home around 02:00hrs yesterday. Many opined that the woman was too tired to have woken up. Jermaine recounted that he along with the firemen ventured into another bedroom where they found Yolanda Cort, seated upright on her bed panting for breath, with one of her daughters lying in front of her on the bed. The man explained that the woman was half-naked and rescuers had to be extra careful as the woman’s skin began peeling at the slightest touch. Cort was rushed to the hospital in an unconscious state. Kaieteur News was later informed that seven persons occupied the three-bedroom house. According to Yolanda’s sister, Sueann Cort, six persons resided there at the time; her brother Kevin Cort, her sister, her cousin and the children. She explained that another family member also occupied the house, but is currently working in the interior. Cort said her boyfriend called her via cell phone at her Anira Street, Queenstown home and informed her about the fire. She explained that her brother assisted the women with the children, but yesterday morning he had left early to attend church. He returned after receiving word of the fire and was at a loss for words. He stood in a corner fighting tears. As more relatives converged at the fire scene, the atmosphere quickly turned to a mood of despair as relatives wailed continuously, especially when the bodies of the infants were being removed from the house. Sueann Cort told this publication that her family is originally from Bartica but after most of the relatives had moved to the city, her sister also made the move to be closer to them. It had been almost two years since the women and their children occupied the upper level of the rented apartment. Residents expressed kudos to fire officials whom they said were quite professional and prompt in their response to the fire. One resident opined that the ranks saved at least seven houses from the blaze, since there are five houses situated in the yard where the burnt house is located. Apart from that, two other adjacent wooden structures were saved from the blaze. Police said in a press release that investigations are being conducted into the fire, which is so far of unknown origin.